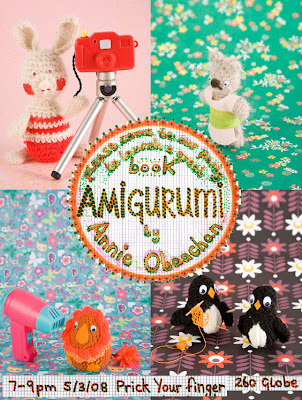 This week we hosted a party for our ANNIE OBACCHAN, author of a fabulous new book 'Amigurumi'. We drank green tea cocktails and ate wasabe peas and everyone marveled at the Amigurumi Cosmos in the window. They are not just cute knitted creatures. They have a weighty cultural significance as laid out in the rather heavy forward which I wrote. Amigurumi is a whole other world, and if you are struggling to live in this one, then buy this book. Annie carefully shows you how to create your own knitted family, movie, work force, army or whatever you like. It's a fast track to something satisfying that fits in your pocket. Thanks to Katy Beven our Ed.